In happy news, I got a new kitty and she is GLORIOUS. Meet Freida! One night, Sari called me from our veterinarian’s office to say that there was a cat up for adoption that she thought I would love. Freida had belonged to a lady with dementia who they believe was accidentally feeding her too many times a day (which is probably better than the opposite of forgetting to feed her?). When she passed, her son brought Freida in to be put down. Since she is totally adorable and healthy, our veterinarian kept her and put her up for adoption! I was SHOCKED to learn that she had been there for four months!! I cannot believe no one wanted her. Freida is nine, weighs 25 pounds, and is bothered by NOTHING. She is so gorgeous and sweet and has the best wee little meow. I am totally delighted and Alan is totally pissed. I feel kind of bad because I am completely obsessed with her, but she is such a pretty cat!!! Poor Alan. Just kidding. Don’t feel bad for him! Freida is super chill and really doesn’t give a crap about anything. She lays around like she owns the place and generally ignores Alan. I got Alan a Thundershirt to help is anxiety, and it made things worse. He just cannot handle anything – just like me! Anyway, I did not intend to get a second cat, but when I saw her little face I just KNEW she had to be mine! Now that I have two cats, the litter cleaning has become a CHORE. 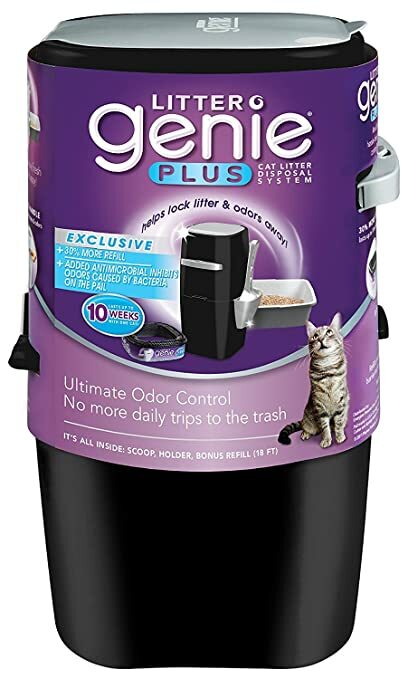 Have any of you used a Litter Genie? I hate having to find a plastic bag, then haul it out to the dumpster every day. I JUST WANT TO BE LAZY. My friend that I house sit for has one of those amazing litter robots, but I am not ready to spend $500 on these little rats (also, I am not sure that Freida would fit inside it…). Not yet at least. This entry was posted in Cats! by Running off the Reese’s. Bookmark the permalink.